I love extended holiday weekends! It's the first work day of the week, and it's already Tuesday! Yes, I could do this more often. I would still include having four 10-hour work days and three-day weekends in my presidential platform. Let's make it happen, people. I have more pictures to show you, and as we all know, there's a simple analogy. Am I right, or am I right? Anyway, here are the pictures! 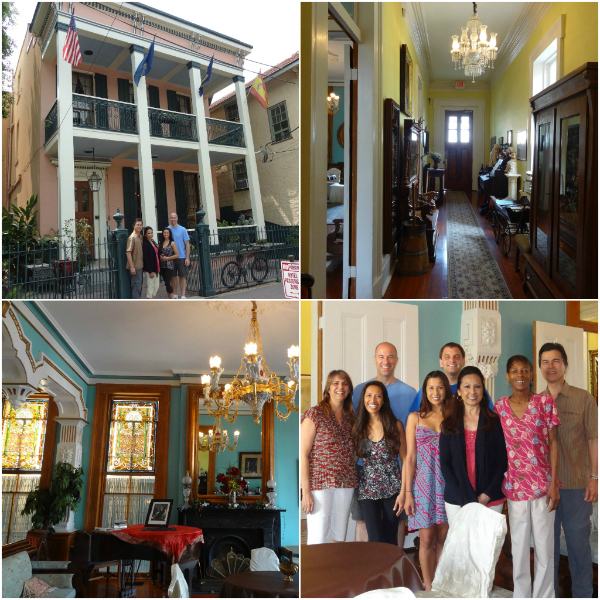 #1: Roaming the French Quarters was so much fun! I love the architecture. #2: The trolley! I fell in love with the subway system when I lived in NYC, and trolleys are cute. There, I said it. I liked the trolleys, because they're cute. #3: Oak Alley Plantation was one of my favorite parts of the trip! The 1,200-acre estate was full of history, not to mention breathtaking views! #4: With our tour guide. She was great! 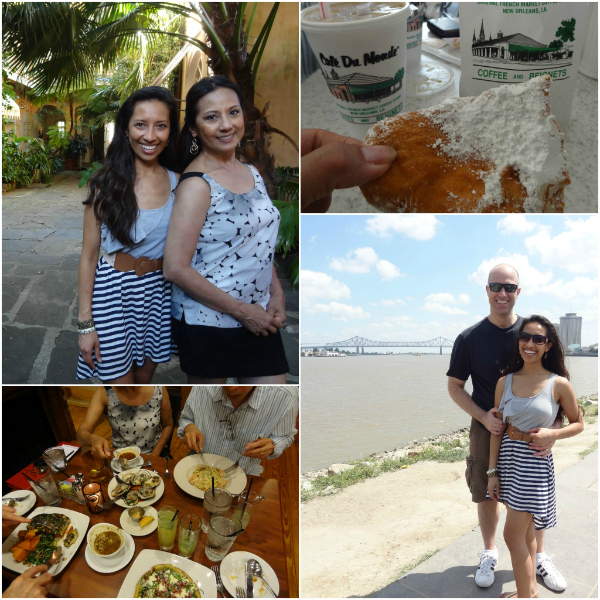 #6: We had to hit up Cafe Du Monde for beignets! It's a Nawlins must! #8: The dream boat and I along the Mississippi River during a break from walking the French Quarters. #9: The Parisian Courtyard Inn. Our beautiful B&B in the Garden District was filled with antiques. So charming! #12: My family with hostess Annette (far left) and staff member Rosie (between my parents) on our last morning together. I loved New Orleans! I wasn't impressed at first, but the city really grew on me. We did a city tour which gave a lot of information, but leisurely walking around the French Quarters gave me the best view of the city. It may look a little run down, but I could really see how vibrant and dazzling it must have been when all the buildings and homes were new and fresh. That's not to say that it isn't dazzling in a different way now. New Orleans has a strong culture, and its flair erupts on every street. Hurricane Katrina really wiped out the Ninth Ward, but the locals are hopeful that it will all be restored with time. Mr. TBS and I started our drive from New Orleans to Houston around noon on Friday. Within 30-40 minutes, we were completely unpacked, organized, and on the couch with the cats watching TV. We like to get settled back in quickly! Amelie and Boone have been total love bugs since we returned, probably because we disappeared for four days. I've been better about posting to Instagram, too, so follow me at SapphireLindsay! Now it's your turn. What did I miss here in the blogosphere? Leave a comment with the link to your favorite/best post from the last ten days! I have always wanted to go to New Orleans! It looks like you had a lot of fun! I love your dress :) And you guys are rock stars for getting everything organized and unpacked... oh man, I wait... way too long. I'm so proud of you for using Instagram on the regular! And I have to admit, I'm with you...the trolley is so stinking cute! As are you in every single picture you posted. Just saying. Yay, you're back! Great pictures, makes me want to take a trip of my own to New Orleans! my goodness... a TROLLEY?!?! They always remind me of Full House!! But that's in Frisco.. you were in NY with tons more shopping around you!! I am the same way too when I get back from a trip... I prefer to unpack IMMEDIATELY and have a clean house to relax in before I do ANYthing!! Oh man, you don't want to know the drool coming out of my mouth when I saw those beignets! DYING. NEED. IMMEDIATELY. Looks like an amazing time with family! I've never been to New Orleans before, but everyone who has gone says it's so fun and has amazing food! Looks like you had an amazing time in NOLA! I LOVE NOLA! Glad y'all had such a fantastic time. That little B&B is so precious! And you're right... trolleys are cute. Hi Lindsay, I've just found your blog via the Better Blogger Network and I love it! Like you, I'm very keen to make my life increasingly sustainable, eco-conscious and ethical, so I'm really excited to have found your blog. OH my goodness it looks like yall had the BEST time! 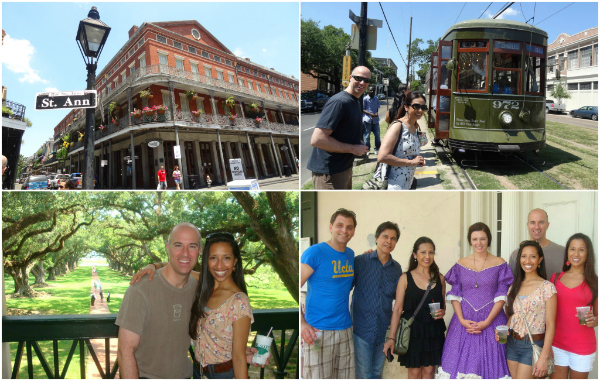 I am jealpous NOLA is on my to-see list! You have the cuteest/coolest/most wonderful family! I am glad they got to come down and get a taste of the south!! Love seeing your pictures :) I've never been to NOLA but would like to. I appreciate architecture and history more and more as I get older.